But there are more chances to win goodies as some of Team A’s Design Team are offering candy too but you need to visit each link in the blog hop! You need to enter the challenge and participate in the blog hop to be eligible for any prizes. If you've come to my blog from Ruth's then you are on the right track and if you get lost just go back to the Polkadoodle Challenge blog as the full list of participants is there. Don’t forget that you need to leave a comment on each of the blogs including Emma Canning's Flat Friends Challenge blog to be in with a chance of winning the mega Polkadoodle prize! Now hop to The Flat Friends Challenge who will show you her creation on the theme! 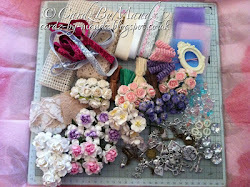 The Blog Hop will end at 12noon GMT on Sunday 20 January along with the challenge, so good luck and happy hopping! Please don’t forget our rules which can be found on the Polkadoodle Challenge blog. Please be patient if not all the links are yet published – if you find a link is missing, please make a note of who you need to visit and come back later. Thanks for stopping by today and I hope you all enjoy the hop and of course the free digi..
Love the ticket tags...such a clever idea. Gorgeous papers and the image is perfectly coloured. Ohhhh lovely card Shell, pretty dots of paper. Great card, Shell! Love the design and papers! Terrific coloring of the sweet image! Love all all the offset layers on your card and the use of ticket sentiments as a border ... very clever. Another stunner from you Shell. Your hair is amazing, I wish I had half of your talent! Sono affascinata dalla luce che hai saputo donare ai capelli.... incantevole!!!! Dovresti dirci i colori che hai utilizzato... per ottenere questo splendido risultato! Lovely card and the ticket tags are great too!